My wife has been using the Calendar app on her iPhone to store many important events under a calendar in her Google account. That Google account stopped syncing with her phone months ago, but she has continued to add events under that Google account on her phone. Now she has many events that only appear on the phone. They are not visible on calendar.google.com. I'm trying to restore the syncing of her phone's calendar events with Google Calendar. I've tried restarting the phone and adding a test event and forcing a refresh, but that didn't work. My next step is to delete the Google account from her phone and re-add it, but how can I first back up the locally stored calendar events so that we don't lose them? I tried syncing calendars with iTunes, but iTunes doesn't let me choose calendars from the Google account - it only shows some default calendars like Home and Work and Calendar that she doesn't use. I synced and verified in the Calendar app on her Mac that it did not sync the calendars from her Google account. What you're looking for is iMazing, which can do exactly what you want, and a whole lot more. The calendar export feature does require a paid license, and it is a pretty expensive program, but it's also available as part of Setapp, a subscription service that gives you access to more than a hundred otherwise expensive applications for $10/mo, but they also have a 7-day free trial. Update your phone and your Mac! There have been many calendar sync issues fixed with updates to macOS 10.13; the phone should be at 10.4.1. On your Mac, sign in to the Google account. Sign up for and download/install Setapp. Connect the iPhone to your mac and perform a full backup of the phone using iMazing (just in case). Make sure all calendars you want to sync are checked, here. On the phone, under Settings > Calendar > Sync, make sure "All Events" is selected. In iMazing, follow the instructions here to export each full calendar as an ICS file. In Google Calendar, import the data from each of these ICS files. Check that all your events, etc., are now available at calendar.google.com. On the phone, delete any and all versions of this same Google Account under Settings > Accounts & Passwords. On the phone, open the Calendars app, tap Calendars at the bottom, and delete any and all remaining/duplicate calendars, particularly if there is one under "On My iPhone", and/or superfluous iCloud calendars. On the phone, open the Calendars app, tap Calendars at the bottom, and delete any and all unused calendars, particularly if there is one under "On My iPhone". A. Switch to using the Google Calendar app from the App Store for iPhone. On the phone, re-add your Google Account in Settings > Accounts & Passwords, making sure to select "Google" as the type, not "Other" or "CalDAV". Once added, check the account, and make sure calendar slider option is enabled. On the phone, go to Settings > Calendar. 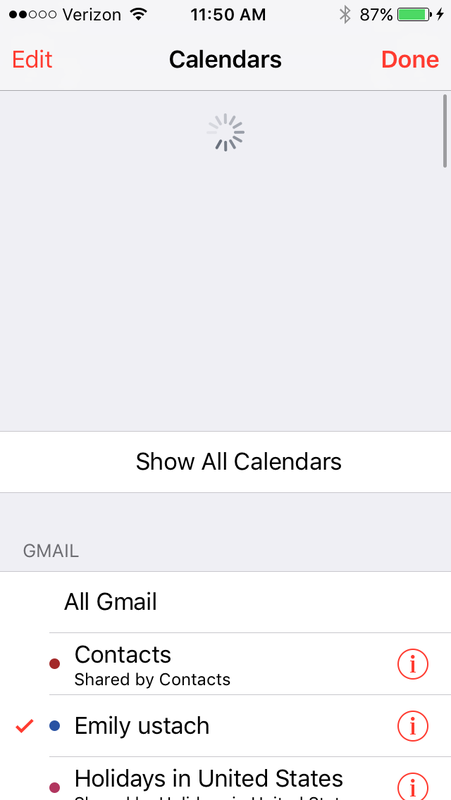 Make sure "Default Calendar" is set under "Gmail" to the correct account. On the phone, open the Calendar app. Under calendars, make sure only the calendar(s) you want are checked. At the top, under Gmail, should be the Google Calendar. Give it a few minutes to sync up; you may need to quit the Calendar app and re-open it. If anything goes wrong you can restore from the backup from step 5. Not the answer you're looking for? Browse other questions tagged iphone itunes calendar ical google-calendar . How can I sync my google calendar with my work exchange calendar with my iphone calendar? How can I stop unwanted notifications from Google Calendar on an iPhone?